The future is collaborative. And that’s what Stories Collective is all about. The stories here are not just the images and words themselves but the stories of the people behind each piece created. Those artists have created, with us, a truly collaborative platform. Not only was this made possible through those collaborations and years of independent hard work, but also through the ProAC program offered by Ministério da Cultura, enabling our sponsor AMARO, a digitally native fashion brand (hey, just like us!) to bet on up and coming talents determined to make it in this new creative economy. On this issue, we asked ourselves: what is art in the post-digital age? We wanted to brainstorm this concept with all our contributors and with you. With the internet, we collaborate with no boundaries as we can see here, we create in the physical share through the digital, all expressed in transmedia narratives. 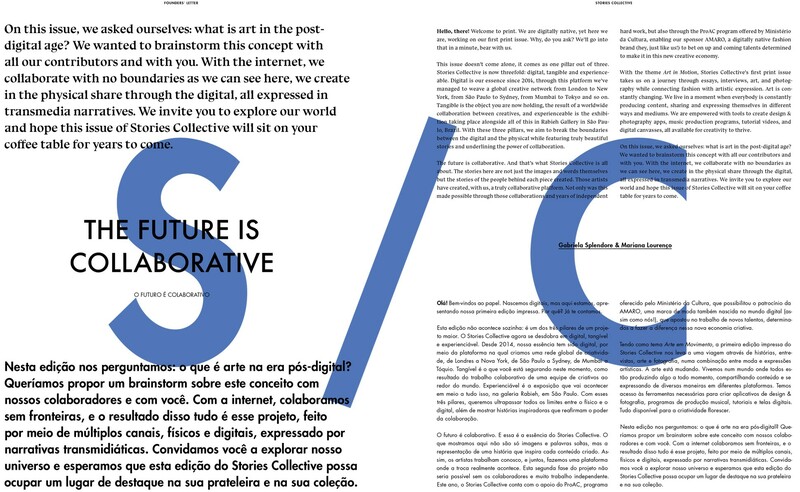 We invite you to explore our world and hope this issue of Stories Collective will sit on your coffee table for years to come.